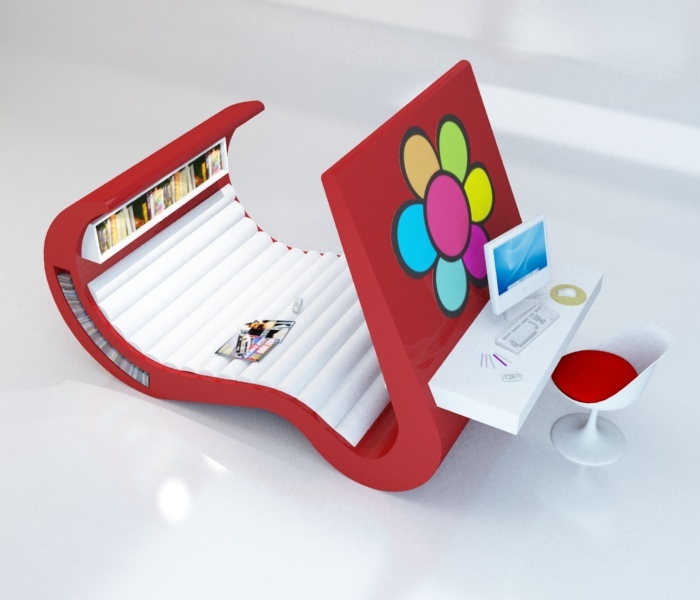 Imagine a furniture to wear... then dress it with an innovator design, intense colors, ergonomics and technology appeal. Like in fashion, the point is to unify beauty, comfort, and functionality. Whether your desire is to watch TV or DVD, listen to your favorite CD, read, talk on the phone, or even study, take a nap or browse the internet, you got it close, in a multifunctional chaise-longue. This concept is inspired by the values and personality of a today's teenager and the standards generated by a global hi-tech culture of facilities, where the access to technology is cheap and easy. This would be great if today’s teenagers all lived in open plan loft conversions. For 99% of your target audience, this idea is literally a waste of space. Rob, there is no reason this would not work in a bedroom in a regular house. I’d be inclined to agree with Jen, properly positioned this could actually resolve issues with two teens in the same room etc. I know it doesn’t quite fit the excellent design, however a ‘privacy curtain’ or similar would make it a perfect personal space item. Think bunk beds in a submarine, just funky! Have one and i love it. where can we buy one from ?